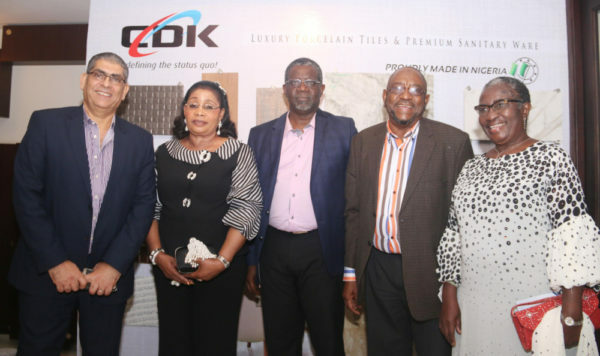 CDK Integrated Industries Limited, the leading producers of authentically porcelain tiles and ceramic sanitary ware here in Nigeria, hosted The Association of Consulting Architects Nigeria (ACAN) to an evening of networking, music, fine dining and knowledge sharing preceded by cocktails. The Pre-AGM dinner was part of the program of activities of this year’s Annual General Meeting of ACAN. 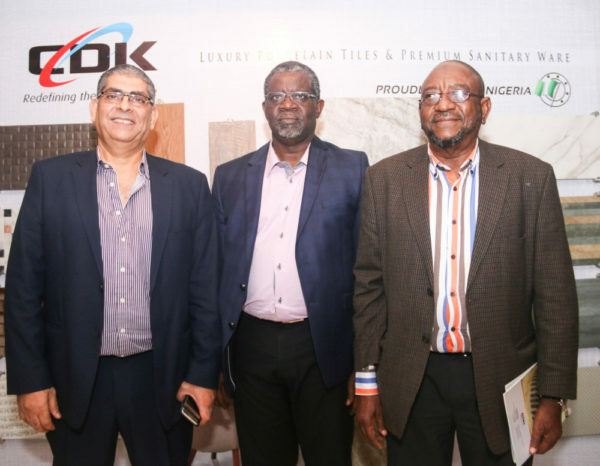 The dinner which was held at the prestigious Wheatbaker Hotel, Ikoyi saw the Association endorsing CDK’s porcelain tiles and sanitary wares’ world-class quality. In attendance were the top management of CDK Integrated Industries Limited. The Association was led by its President, Arc. Mansur K. Ahmadu FNIA. and, FNIA. 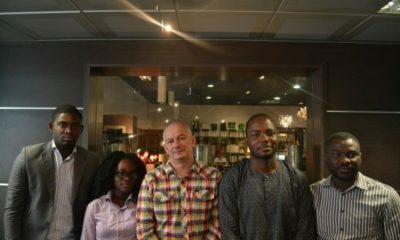 Other representatives of the member firms of the Association were present including the Vice-President, Arc. Ayoola Onajide, five past Presidents of the association in the persons of Arc. Kit Ibare Akinsan, Arc. Tayo Babalakin, Arc. Fred Coker, Arc. Roti Delano, and Arc. O. P. A. Ladega. Two past Presidents of the Nigerian Institute of Architects (NIA), also graced the occasion: Arc. Olubukunola Ejiwunmi, the first female to hold that position and Arc. Ovo Charles Majoroh; and, members of the press. The event presented an opportunity to provide a unique insight of the production and quality control processes that account for the quality of its “Proudly Made in Nigeria” Porcelain Tiles and Sanitary Wares and for the members of the profession to interact with the CDK management and ask questions and seek clarifications. 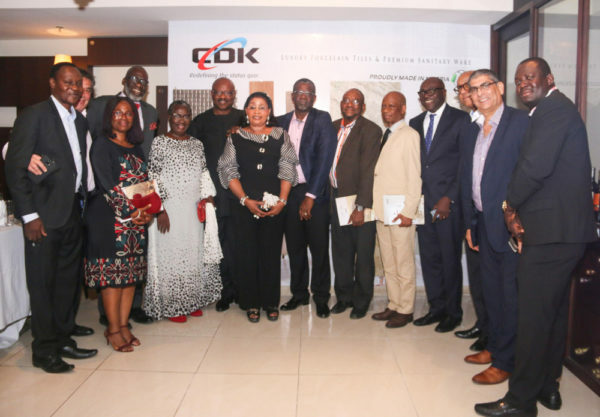 Members of the Association, many of whom confirmed that they had used CDK products in projects in various parts of the country testified to how impressed they are of the outstanding quality of the company’s products which they described as world class. Speaking at the event, Bernard Longe, MD/CEO of CDK in his opening address confirmed that it was always the specific objective of the promoters from conception that the company differentiate itself from the competition by producing porcelain tiles and sanitary ware of export quality and, he affirmed that he is very satisfied that this objective has been achieved. porcelain tiles are harder than ceramic and are therefore more suitable for external use and high traffic areas. In the case of sanitary ware, which in the absence of any meaningful sustained local production had always been import-dependent, the well known authentic European brands of old have been largely driven out of the Nigerian market by virtually indistinguishable cheap inferior imitations imported from East Asia. He stated that a major advantage of buying CDK branded sanitary ware is that you have no doubt whatsoever of what quality you are buying. CDK tile and sanitaryware manufacturing processes are fully automated using state of the art machinery complemented by very highly experienced and committed production team. The company has fully digital printers, which means that in addition to CDK’s own regular models and designs, it can produce any customized designs of customer’s choice as well as modifying tile attributes to address specific needs and usages such as specially enhanced surfaces for very high traffic areas such as malls, banking halls, hotels, factory floors etc., and where the intended usage so requires, enhanced slip resistance, extra thickness etc. He was of the view that whilst before the entry of CDK into the market, the case could justifiably be made that for the upper middle class and the more affluent and discerning segment of the market, there was no choice but to go for imports for high-end quality tiles, this is no longer the case. He asserted utmost confidence in the quality of CDK products which are of comparable quality with the best of imports from Europe. The company showcased some of its new product range to be introduced at the beginning of the new year such as its flagship sanitary ware set “Onella” and, larger size tile formats; 60x120cm, 45x90cm, wooden effect strips in 20x120cm, 30x120cm; wall tiles in 30x60cm and 22.5x90cm in enhanced finishes such as 3D, sugar effect, metallic sugar effect, with or without glossy ink. All to be available in satin, glossy glaze and matte finish as required. CDK currently employs locally more than 600 hundred citizens at different levels and it is obviously in the overall interest of the economy to expand local manufacturing capacity and provide more employment opportunities for the teeming army of unemployed youths. The CDK factory is located on 50 hectares of land in Sagamu, Ogun State just after the Lagos-Ibadan Expressway Interchange and that the size of the property acquired is a pointer to the future aspirations of CDK not only to expand production of its present product lines but to also venture into local production of related products such as bathroom and kitchen faucets all of which are presently imported. He ended by emphasizing the strategic importance of the Architectural profession as the first point of contact in project development and, the desire of his company to collaboratively engage with the Association and its members to give them the confidence to specify CDK products without any reservations. 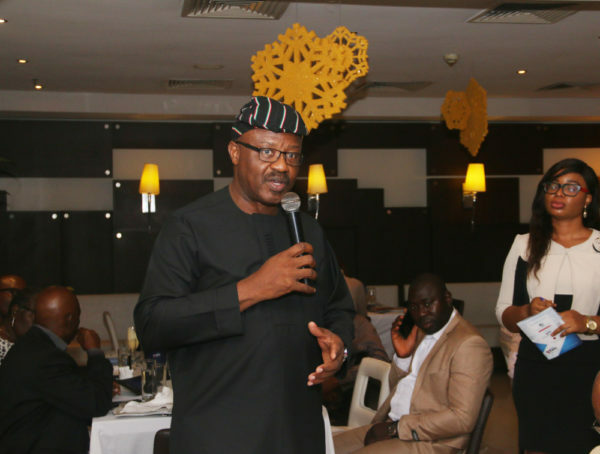 He also expressed the hope that members of the esteemed profession will help in weaning the upper-middle-class and affluent Nigerians away from the predilection for “foreign” or “imported” as defining quality attributes of these products. The dinner ended with review and feedback sessions, where many of the architects who confirmed having used CDK tiles and sanitary ware in various projects shared positive testimonials of the products and pledged their support for CDK. 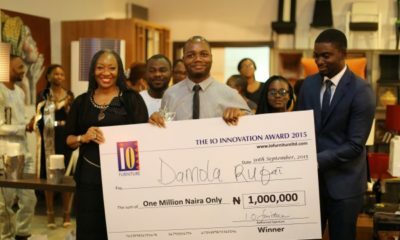 Damola Rufai Emerges Winner of the IO Furniture Innovation Award!